Ireland’s native dairy cattle breed, Kerry Cattle, is under threat of extinction due to declining numbers of pedigree cows. This is according to Wexford TD John Browne who, in a parliamentary question this week, asked the Minister for Agriculture, Simon Coveney, what measures are being taken to secure the survival of the breed. Kerry cattle are a rare breed of dairy cattle, native to Ireland. They are believed to be one of the oldest breeds in Europe. Their coat is almost entirely black, with a little white on the udder. The horns are whitish with dark tips. There are more than 100 registered Kerry cattle herds in Ireland. 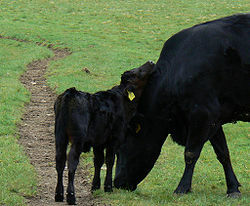 Small herds of Kerry cattle are also present in the US, Canada and in the UK. According to the minister, the department is aware of the importance of conserving and maintaining the genetic resources that are native to Ireland and as a result has put in place a number of measures to assist the keepers of rare and native breeds, including Kerry cattle. Currently the department is preparing a new agri-environmental scheme as part of the Rural Development Programme which will commence in 2015. In addition, under the Kerry Calf Grant Scheme, a payment per live calf is payable to keepers of Kerry Cattle, €66.18 in 2013. “The Kerry Cattle breed is the sole recipient of a grant of this nature at present. Furthermore, under the Genetic Resources for Food and Agriculture Grant Scheme a total of €70,303 was provided between the years 1997 to 2012 for various research projects in relation to the conservation of the Kerry cattle breed,” the minister added.